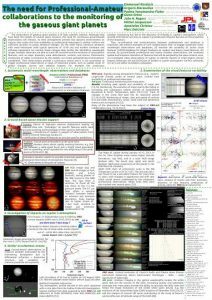 The observation of gaseous giant planets is of high scientific interest. Although they have been the targets of several space missions, the need for continuous ground-based observations still remains. As their atmospheres present fast dynamic environments on various time scales the time availability at professional telescopes is neither uniform not sufficient duration to assess temporal changes. On the other hand, numerous amateurs with small telescopes (with typical apertures of 15-60 cm) and modern hardware and software equipment can monitor these changes daily (within the 360-900nm wavelength range). Amateur observers are able to trace the structure and the evolution of atmospheric features, such as major planetary scale disturbances, vortices, and storms. Photometric monitoring of stellar occultations by the planets can reveal spatial/temporal atmospheric variabilities. Their observations provide a continuous record and it is not uncommon to trigger professional observations in cases of important events, such as sudden onset of global changes, storms and celestial impacts. For example the continuous amateur monitoring has led to the discovery of fireballs in Jupiter’s atmosphere, which provide information not only on Jupiter’s gravitational influence but also on the properties of the impactors. Thus, co-ordination and communication between professionals and amateurs is important. We present examples of such collaborations that: (i) engage systematic multi-wavelength observations and databases, (ii) examine the variability of Jovian cloud features (JUPOS-Database for Object Positions on Jupiter) and Saturn cloud features, (iii) provide, by ground-based professional and mainly amateur observations, the necessary spatial and temporal resolution of features that will be sampled by the space mission Juno, (iv) investigate video observations of Jupiter to identify impacts of small objects (Jovian Impacts Detection-JID and DeTeCtion of bolides in Jupiter atmosphere -DeTeCt software), (v) carry out stellar occultation campaigns. You can also download the poster as a pdf file.